A simple table for two allows you to tell your story to, share a great dinner or just enjoy a game with another person on a fine intimate evening. 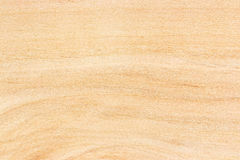 I have been looking at this simple design at my favorite DIY woodworking website. It should be worth the effort to build this simple table for two. The shopping list is pretty short, considering that there are plenty of parts to cut and then put together to make the table. The wood materials comprise the following: One 4′ x 8′ sheet of ¾” cabinet-grade plywood; Four 8′ lengths of 2×4 lumber; and 4/4 hardwood stock for plywood edging. Attachment elements include PVA wood glue; 30 3/8″ wood plugs; 1″ finish nails. Wood screws are also needed, and their distribution is 14 3″ No. 8 wood screws; Six 2″ No. 8 wood screws; 10 2½” No. 8 wood screws; and 12 1¼” No. 8 wood screws. The 2 x 4 wood should be cross cut to size, then the dirty, cracked and rough factory edges trimmed off. The longest parts should be cut first, and these include the apron and stretcher. This helps make the most of the lumber. It is also much easier to work your way down to the shortest segments of the table, which are the uprights of the DIY furniture. Holes are to be pre-drilled into each leg, then positioned ¾ inches from each edge. The legs are clamped to the cross-braces, then a 3-inch screw is driven into each hole. Two mortises are then marked on the stretcher, with each mark being 1.75 inches deep and 1.5 inches wide, then placed 18 inches from each end. A relief hole is drilled in a corner. Using a jigsaw, a mortise is cut out. Matching tenons 1.75 inches wide and 1.5 inches long should be cut in one end of each table upright. A table saw with a dado stack is used to slice out a ¾-inch deep by 3 ½-inch long rabbet on each table upright’s other end. To create a half-lap joint, a matching rabbet should be cut on one end of each table support. Relief cuts can be made using a hand saw or miter saw if a dado stack is unavailable. Use a chisel to remove waste. An inch down from the top edge, 45-degree cuts should be made on the other end of the pieces. The pieces are then glued together at right angles. Then, they are fastened via four 1.25-inch countersunk screws spaced evenly. After applying glue to the tenons on the table uprights, they are inserted into the mortises of the stretcher. Using 3-inch countersunk screws, clamp and fasten them together. After attachment of the apron to this assembly, work on the plywood surfaces can commence. Using a circular saw, create angled cuts in the plywood blanks. To guide the saw and keep it straight, clamp a straightedge to your plywood. ⅜-inch strips can be ripped from the 4/4 hardwood stock for the edging. A hand saw or miter saw can be used for this task. The pieces can be overlapped or mitered at the corners, then glued and nailed into place. A router and a flush-trim bit are used to trim the excess when the glue dries. Each bench is then fastened by clamping to the leg assembly. Three 2-inch screws are driven through the stretcher, right into the underside of the bench, taking care not to drive too deeply to prevent the tips from penetrating the surface of the bench. Using 1.25-inch pocket screws, attach the plywood tabletop. 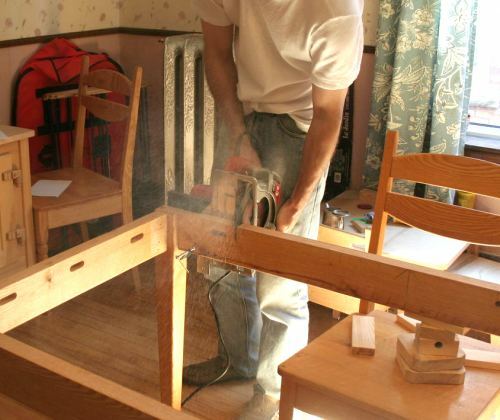 After clamping a Kreg Jig to each table, support bore two holes inside each one. A little glue should be applied to all visible countersunk holes, which are then plugged using ⅜-inch wood plugs. Gently tap the plugs in. Using a flush-cutting saw, trim the plugs flush after the glue dries. Use 120-grit paper to sand the table smooth, followed by the 180-grit paper to refine the texture of the furniture. Put two coats of clear polyurethane. You should also sand using 220-grit paper between each coat application.